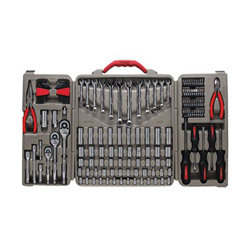 Professional-grade 148-piece tool kit comes packed in a durable, high-impact plastic storage case. Complete tool kit contains necessary tools for most industrial tasks. Tools lock in place for secure storage. Raised-letter ID marks each tool location. Meets ANSI and ASME specifications. Tool Kits Type: Combination Set; Number of Pieces: 148. Multi-Purpose Tools from Cooper Hand Tools! 6 In Stock today.